EMPOWERING SURGEONS TO PERFORM GROUNDBREAKING, MINIMALLY INVASIVE PROCEDURES. THE WORLD'S MOST ADVANCED HYBRID SURGICAL THEATRE. Every element of the hybrid IMRIS Surgical Theatre is crafted for the human experience. Its design is optimized for a surgeonâs specific workflow. Its hybrid modalities are proven to facilitate better patient outcomes. And its unique capabilities are maximizing value for the worldâs leading neurological institutions. The hybrid IMRIS Surgical Theatre is the future of health. And the future of health is human. In 1998, the Bovie team had attended a conference in Dusseldorf, Germany, where it came across a plasma-based technology that appeared promising. Bovie entered into a joint venture agreement to develop and bring the product to market. In 2007, Bovie bought out its partner and continued development on its own. That product became J-Plasma®, which utilizes a gas ionization process to produce a stable, focused beam of ionized gas that provides surgeons with greater precision, minimal invasiveness and an absence of conductive currents through the patient during surgery. Just as a liquid can be excited into a gas state, plasma is created by adding energy to a gas. J-Plasma uses helium gas, passed across an energized electrode – which can also be extended for an enhanced cutting effect – to create a focused stream of low-current cold plasma. With its high level of precision and minimal thermal spread, J-Plasma can enable and improve surgical and nonsurgical treatment across a broad range of specialties and procedures. in a spine program can improve the execution and outcomes in a wide variety of procedures, including: minimally-invasive and percutaneous degenerative repair, pedicle screw fixation for complex spinal deformity, and vertebral augmentation. Clear vision should be the standard. We think surgeons should have consistent, clear vision for every procedure. So we designed FloShield. The FloShield system includes a sheath that directs carbon dioxide gas (CO2) to the tip of a laparoscope and actively protects the lens from condensation, debris and smoke. We call it Vortex Barrier Technology™, and it reduces, and in many cases eliminates, the need to remove a scope during laparoscopic procedures. FloShield is available with Flo-X in situ, which allows surgeons to flush the lens intra-operatively. The ability to clean the lens without removing a scope greatly enhances the surgical flow while potentially reducing the length and overall costs of procedures. Progress in pharmaceutical research, diagnostics, and therapy requires high-performance and precise position systems, e.g., for control of laser beams in ophthalmology, three-dimensional imaging of endoscopes as well as for new, also three-dimensional, lithographic processes which allow simulation of even the smallest cell structures. In addition to high positioning precision, requirements for the drives often include compact dimensions, low energy consumption, speed, and high reliability. Over the last four decades, PI (Physik Instrumente) has developed into the leading manufacturer of nanopositioning technology. The key element and motivation of the entrepreneurial behavior have always remained the same: Finding the best possible solution for the customer. PI is well known for the quality of its products and has been one of the leading players in the global market for precision positioning technology for many years. One of the most important building blocks for this is the team spirit within the international PI family, which is based on mutual understanding and support that goes beyond international borders and functional restrictions. PI is a privately owned company with healthy growth, more than 1000 employees worldwide and a flexible, vertically integrated organization, which enables PI to fulfill almost any request in the field of innovative precision positioning technology. The foremost priority for PI is to be a reliable and highly qualified partner for the customer. Artis zee is a proven and reliable system that delivers optimal image quality at lowest dose, letting you optimize your procedure mix, and invest with confidence. It is equipped with industry-leading imaging technology, unique dose management tools, and the latest clinical applications based on the innovative PURE® platform. Due to the very slim design, the Artis zee floor fits rooms as small as 29 square meters. The Artis zee floor features a floor rotation point with motorized swivel, which allows rotation to a left-side position for unrestricted head access. These ensure optimum access to the patient’s head as well as extensive coverage from head to toe without patient repositioning. As demand for interventional procedures increases, so does the need for your clinical team to function more efficiently. Artis zee meets the challenge with ergonomically designed controls. Artis zee systems are designed to exceed the imaging requirements of surgery, interventional cardiology, and radiology, and provide free access to the patient for the anesthesiologist. 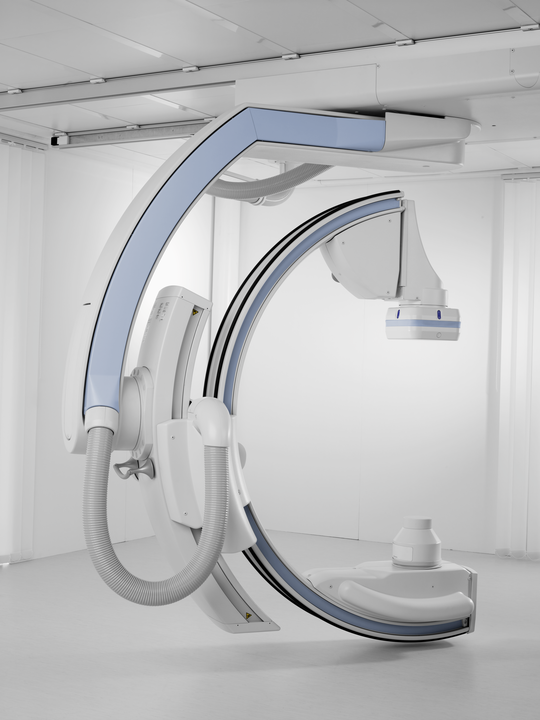 The Artis zee ceiling system offers extended parking capabilities far away from the table, providing free access to the patient. Any medical information published on this website is intended purely as a informational tool only and is not intended as a substitute for informed medical advice and you should not take any action before consulting with a health care professional. The Copyright© of all images and documents is by the According Developing Group, Institute, Editor or Company. We only included data and images freely accessible. Click on Images to be linked to matching website.